A menu item is selected in the menu. public String getActionCommand() Returns the name over the button, item or menuitem that was clicked to trigger the ActionEvent. public long getWhen() Returns the time when an ActionEvent was generated. 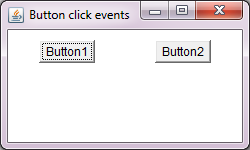 public void actionPerformed(ActionEvent ae) Invoked when an Action Event is generated. public void addActionListener(ActionListener object) where object is an object of the class that has implemented ActionListener interface and wanted to register itself to listen and respond to ActionEvent generated by a click on this specific source. In the upcoming code, we are going to create a class that will listen to ActionEvent, by implementing ActionListener interface. In this code, ActionEvent is generated when a source, i.e. button, is clicked. 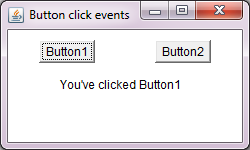 //Registering the class ActionEx1 to listen to ActionEvent, when buttons are clicked. button1.addActionListener(this); //this represents current object of ActionEx1 class. When you click on any of the buttons, you will be displayed an appropriate message, for example, when you click on Button1 button, you get a message "You've clicked on Button1", as shown in figure below.